This is a simple, creamy pasta dish recipe that will take you only 20 minutes to make and is a very light pasta meal for summer. The perfect lunch or dinner when you’re in a pinch! I don’t usually post on weekends, but I was too excited to share this pasta dish recipe with you and didn’t want to keep it all to myself even a day longer! This 20 Minute One Pot Pasta with Fresh Tomatoes and Basil took me literally twenty minutes to make and it was all done in ONE pot (in case the title didn’t make that clear to you). It was light, perfectly creamy, and done in a flash. This 20 Minute One Pot Pasta with Fresh Tomatoes and Basil will be made over and over again in our house, possibly as often as my Philly Cheesesteak Pasta. OH, and it’s inexpensive to prepare and you also won’t be slaving away washing dishes all night! You will love this dish. It might not seem like it would pack a ton of flavor, but it really does. The red pepper flakes gave it a hint of spice and the starch from the pasta cooking gives it a little bit of creaminess. It does NOT lack flavor whatsoever. I’m gonna make this short and sweet, but I hope you have a great weekend. Any fun plans to tell me about? I will be packing for vacation and getting the house ready for our house-sitters! Oh…and I may or may not have put my Christmas tree up today. I always find the days leading up to going away on vacation to be so hectic, but there’s always time to find three hours out of my day to bust out the Christmas decorations and the tree! Hey, at least I managed to hold out until November this year. 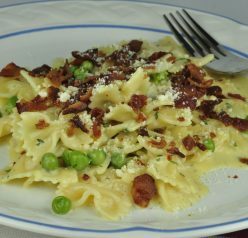 If you love one pot Italian dishes, try my Authentic Italian Pasta Carbonara. Enjoy! This is a simple, creamy pasta dish that will take you only 20 minutes to make. The perfect lunch or dinner when you're in a pinch! Combine all ingredients in a straight sided large skillet or pot (I used my 5.5 qt dutch oven). Bring to a rapid boil and then reduce heat just enough to keep it boiling and toss it constantly with tongs for about 10 minutes. 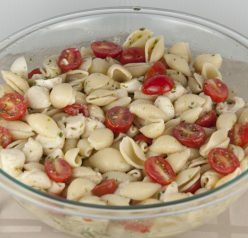 The water and tomatoes will reduce down and the pasta will release starches that thicken it and make it nice and creamy. Do not wait for all of the liquid to evaporate - you want some liquid to remain for the "sauce". Taste the pasta as it finishes cooking. Once the pasta is to your desired softness, remove from the heat. Season to taste with salt and pepper, divide among 4 bowls, and garnish with basil. Serve with oil and fresh shredded Parmesan cheese. Enjoy! Yum this looks good. Thanks for sharing. Everything about it was good!! 🙂 Have a great weekend! 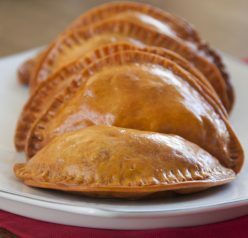 simple and delicious, i must have that for lunch. It would make for a really easy lunch! Can I please have this for lunch today?? It looks awesome and really flavorful! Yum!! This sounds so perfect for busy week nights! I love a quick meal when I am feeling crazy busy. oooooooooooooooh this pasta looks so delicious and fresh!! I LOVE that you put your Christmas tree up! I still have some Halloween decorations up, but then it will be time for Christmas! I go right from Halloween to Christmas! 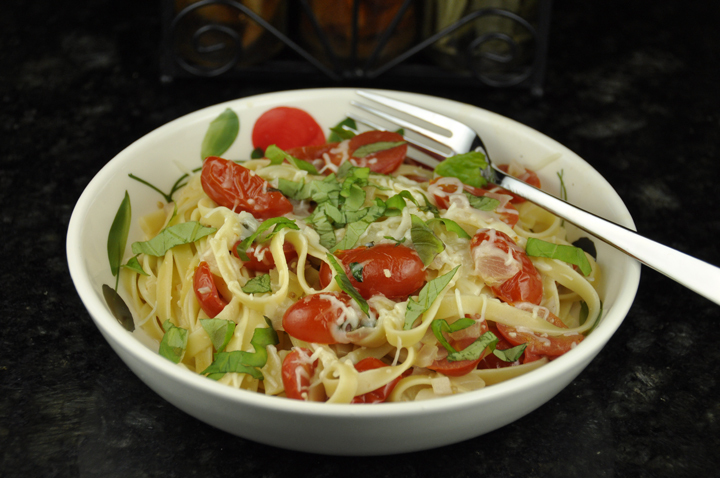 The fresh tomatoes sound delicious in this pasta! Oh I’m the same way! You put the tree up?!?!?! Haha. 😉 My jack-o-lanterns and pumpkins are still hanging out on the front steps. I don’t dare put the tree (a real one) up before Thanksgiving . . . it will drop all of its needles before Christmas even arrives! What does your husband think of your zeal for Christmas? Mine would probably protest against any decorations this early, lol. Also, your blog is responsible for a lot of my pregnancy cravings. 😉 Be glad you don’t live near me or I would be over at your house all the time begging for food! Love speedy meals! And tomato + basil is always a winning combo in my book. I love a great and quick pasta meal! This dish is so fresh and full of flavor! Also I’m in love that you put your tree up – we are actually getting the holiday decorations out of storage right now! There’s a ton of flavor in this dish! Anything that’s quick and tasty has my number. This looks great – thanks! One pot? Twenty minutes? Delicious? I’m sold! This will be happening in our house ASAP! YAY! I’m so glad that you liked the pasta, Ashley! Have a fabulous week! What a beautiful plate of pasta, it reminds me of fresh summer flavors and I need that reminder, it is freezing today! i guess a pinch of chilli flakes made it even better for my licking! I usually decorate for Christmas on Thanksgiving weekend, but since it’s late this year I was thinking on putting up the tree a week before. Wow, you’re mad early…I love it! What a way to get into the spirit. I seriously need more 20 minute meals and this looks ideal. I can see why you’d make this over and over again. Definitely a must try! This is genius! Pretty much the perfect dinner for a time-crunched cheapskate like me. 🙂 You always have the best dinner ideas! Thanks Ashley! Haha I love it!! Thanks!! Aww…I love that you put your Christmas tree up already! The best idea ever for vacationers before the Thanksgiving holiday. This way, one less thing to do. Then, while you’re busy, you can enjoy it. These one pot pasta meals have me so intrigued. I think the trend started after the trend of baking lasagna without boiling the noodles first took off and compensating with additional water in the sauce. However the trend started, aren’t we all happy? Thanks for a great weeknight meal idea!